So He Goes -- Kurt Vonnegut, Jr. 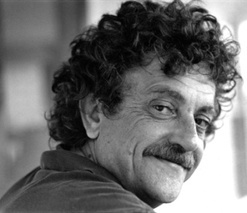 IN MY VERY FIRST POSTING ON THIS BLOG nearly a year ago, I tried to make it clear that, while I got the name of this blog from Kurt Vonnegut, Jr.'s book "Slaughterhouse Five," I don't consider myself a Vonnegut aficionado. But it seems only right that I would say something about him now that he just passed away. I read a couple or three of his books, and I liked them. I'm not sure I was as inspired as many people my age were by them. Entertained, yes. But I didn't always get his messages. Not because, in retrospect, they were too subtle, but maybe because they were too overt and then mixed up with all the science fiction stuff that threw me off. It was great writing for sure, but not my bag. "Slaughterhouse Five" was another matter, and maybe that's because it was so personal and so harrowing at the same time. How could one have lived through the firebombing of Dresden and then written such a tragic and comic account of it as "Slaughterhouse Five." The obituaries talk about how the experience "seared" Vonnegut's consciousness for the rest of his life, which had to be true enough. (I just wish the obit writers could have come up with a less trite phrase for such a moment.) The memory was, it seems, not only a tragic but also sublime. "I think it would be the moment where I was doing everything right, where I was beyond criticism. It was back in World War II. It was snowing, but everything was black. The trucks were rolling in. I was surrounded by my buddies. And my rifle was between my knees, my helmet on my head. I was ready for anything. And I was right where I belonged. That would be the moment. It would have to be the moment." Interesting quote from a guy with whom we tend to identify as an anti-war icon -- even as recently as the last few months when he continued his fierce assault on political leadership that took us into our current leadership. But, I understand: that quote isn't an expression of blood-thirsty aggression but of a moment of perfect harmony with himself and the people around him at a time of great need. It explains why people of my generation will never fully understand the experience he and many others like him went through. We can only salute it. Which is another reason why I was so taken in by "Slaughterhouse Five," as I am by nearly any well-written book (particularly personal narrative) on wartime. I try to put myself in the shoes of the people there, even though I'm sure that I can't possibly imagine what they actually felt and saw. The Battle of the Bulge! The life of a POW! The bombing of Dresden! I can't comprehend. As I wrote in my first posting, in "Slaughterhouse Five" Vonnegut used the phrase "So it goes" to describe a banal sense of numbness to tragedy. I suppose that was something one acquires in the face of so much death and destruction in a place like Dresden. Because I can't really relate to that and generally hoped to be a bit less cynical than that, I set out to use the phrase in a different sense. As I wrote: "I'm attracted to the phrase mostly because of the second word -- 'It' -- which in this case can stand for almost anything. This blog, wherever it goes, will be about that: almost anything." When I did a little cursory research on Vonnegut, I think that may be one thing he and I had in common. He had some consistent themes, but he was thematically all over the place. It worked for him, in part, I think because he took the chance, put his head down, wrote and got published (it helps to be witty and talented). He also wrote at a time when there were lots more outlets for fiction writers. There were many magazines that would take his stuff and that of lots of others like him, so he could make a living between his 14 novels and other projects. He didn't need any stinking blogs. The other thing we had in common was that we're both from Indianapolis. His family goes back generations there and made a major imprint on the city. There are still Vonneguts in living there now. So for me one of the most memorable passages of his writings was this one below from "Cat's Cradle." The main character, modeled closely on Kurt Vonnegut himself, is on a plane in, as I recall, some far-flung place, and he bumps into someone from Indiana. "Crosby asked me what my name was and what my business was. I told him, and his wife Hazel recognized my name as an Indiana name. She was from Indiana, too. "'Hoosiers do all right. Lowe and I've been around the world twice, and everywhere we went we found Hoosiers in charge of everything. "Not only him, but the Hollywood Editor of Life magazine, too, And that man in Chile . . ."
"'You can't go anywhere a Hoosier hasn't made his mark,' she said. "'Are you from Indiana, too?' I asked her husband. "'Let me hear you say it,' she urged. "She smiled and let go of my arm. Some piece of clockwork had completed its cycle. My calling Hazel 'Mom' had shut it off, and now Hazel was rewinding it for the next Hoosier to come along. "Hazel's obsession with Hoosiers around the world was a textbook example of a false karass, of a seeming team that was meaningless in terms of the ways God gets things done, a textbook example of what Bokonon calls a granfalloon. Other examples of granfalloons are the Communist party, the Daughters of the American Revolution, the General Electric Company, the International Order of Odd Fellows--and any nation, anytime, anywhere." I haven't lived in Indiana full time since I was 18, which doesn't make me a very loyal Hoosier. But I still get a kick out of that scene (which Vonnegut probably didn't make up). It sounds all too real. I guess I have a little false karass in me. Maybe that would disappoint Kurt Vonnegut, Jr. But that's the best tribute I can give him. 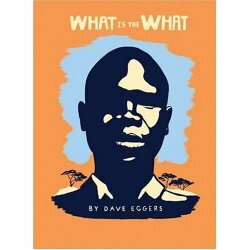 DAVE EGGERS' NEW BOOK WHAT IS THE WHAT made me feel sadness, fear, awe, joy, pride and a whole range of other emotions for the lead character, Valentino Achak Deng, whom we follow from boyhood in his native Sudan into his late 20s in Atlanta, Georgia. When I finished with his story of countless brushes with death -- either his own or that of people around him who do not survive -- and of unimaginable deprivation, I could only feel one thing: lucky. It sounds truly corny, but all through the reading of this 475-page book, I felt that the only difference between me and Valentino Achak Deng was the luck of where we born and the "tribe" of people into which we were born. He was born and grew up in Marial Bai, a small Dinka village in the southern part of Sudan. In the mid-1980s, when he was seven years old, Achak's typical agricultural community (though his father was a successful merchant there) was attacked by Arab Muslims from the north at the behest of the Sudanese government in Khartoum. Attacks like this were happening thoughout the south. Villages like Marial Bai were being burned to the ground, their adult males killed, women abducted and cattle and other goods looted. Boys like Achak who could would just run, and run, and run as far and as long as possible. That's what Achak did, and he eventually joined thousands of other so-called "lost boys," who walked for months seeking shelter and relative safety in Ethiopia and later Kenya. Along the way, they were attacked by the Sudanese army, wild animals and other Sudanese villagers, who saw them as competition for scarce supplies of food. They would die of disease, starvation, exhaustion, drowning dehydration or any number of other maladies. They were heavily recruited by the rebel armies, which treated them as fodder and would just as soon wear out their lives. They were completely alone and witnessed firsthand more horrors of the world the most of us will ever dream of. Achak made it to refugee camps, first in Ethiopia and later in Kenya, and he spent a total of about a dozen years in them. I'm not giving anything away -- Eggers reveals this in the opening of the book -- to say that Achak makes it to the U.S. as a refugee, and the odyssey of his complicated and sometimes painful entry into this strange culture is rich and fascinating. At every point in the book, Achak -- sometimes he goes by Valentino, by the way -- is forced to make difficult choices: life and death choices, existential choices, choices about loyalty to self and loyalty to nation and family, choices about whether to not trust others and his own instincts. Again, it is more than most of us have to face, and it's hard to believe that a person could make it through with his wits intact. And, so it seems, he does. Valentino Achak Deng is a real person, even though What is the What, his autobiography, is written by someone else (Eggers) and is a novel, a fictional account. Don't worry. Strange as that sounds, it really works. And, again, there is, it seems to me, no way for a Westerner to read this book without feeling lucky. When you read about young boys walking for days in the hot sun with almost nothing to drink or eat, you have to feel lucky and grateful for even the bounty of the contents of a vending machine, let alone of our typical grocery stores. When you read of Achak's ten-year residence in the limbo of Kakuma refugee camp in Kenya, a sort of no-man's land detention area, where he could have just as easily never left were it not for U.S. government officials who decided to bring several thousand Sudanese "lost boys" to our shores, you can you feel lucky to have been born a citizen of the U.S. When you read of Achak catching a ride in the back of a pick-up, only to realize as it speeds off that he is knee deep in dismembered bodies, you realize how lucky you are to have merely petty worries. When you read that, even in the most secure conditions of the refugee camp, Achak and tens of thousands of others lived in rooms built with tree branches and other random materials and would stand in lines for an hour or so every morning with jerry cans to fetch the day's water, it should almost shame you to walk into your relatively cavernous home, appointed with electricity, HVAC and plumbing -- let alone with the fine furnishings and electronic gadgets that many of us can't seem to live without these days. When you read of his loneliness and desire to learn the fate of his family, you feel lucky to have yours nearby. When you realize throughout the book that he has survived this trauma, you feel lucky to have a person of such a constitution as Valentino Achak Deng around. This is not only a great book but a great life lesson, too. 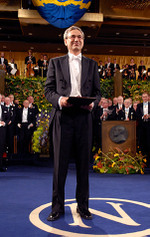 THE CURRENT ISSUE OF THE NEW YORKER published the lecture Orhan Pamuk delivered as he received his Nobel Prize for Literature last week in Stockholm. It's such a remarkable essay that I'd like to commend it to others to read or, if you wish, watch on streaming video via the Nobel Web site. The writer’s secret is not inspiration—for it is never clear where that comes from—but stubbornness, endurance. The lovely Turkish expression “to dig a well with a needle” seems to me to have been invented with writers in mind. In the old stories, I love the patience of Ferhat, who digs through mountains for his love—and I understand it, too. The angel of inspiration (who pays regular visits to some and rarely calls on others) favors the hopeful and the confident, and it is when a writer feels most lonely, when he feels most doubtful about his efforts, his dreams, and the value of his writing, when he thinks that his story is only his story—it is at such moments that the angel chooses to reveal to him the images and dreams that will draw out the world he wishes to build. I believe literature to be the most valuable tool that humanity has found in its quest to understand itself. Societies, tribes, and peoples grow more intelligent, richer, and more advanced as they pay attention to the troubled words of their authors—and, as we all know, the burning of books and the denigration of writers are both signs that dark and improvident times are upon us. [Notably, Pamuk himself was forced to flee his native Turkey for several years after he spoke openly about the Armenian Genocide at the hands of his countrymen in 1915. For that, his government was prepared to try him for insulting Turkey and Turkishness. The charges were later dropped.] But literature is never just a national concern. The writer who shuts himself up in a room and goes on a journey inside himself will, over the years, discover literature’s eternal rule: he must have the artistry to tell his own stories as if they were other people’s stories, and to tell other people’s stories as if they were his own, for that is what literature is. Turkey is often referred to as having a foot in both the East and West, and here Pamuk speaks from that vantage point in a way that people on both sides of the divide might do well to hear. He writes: We have often witnessed peoples, societies, and nations outside the Western world—and I can identify with them easily—succumbing to fears that lead them to commit stupid acts. I also know that in the West—a world with which I can identify just as easily—nations and peoples that take an excessive pride in their wealth, and in their glory at having brought us the Renaissance, the Enlightenment, and modernism, have, from time to time, succumbed to a self-satisfaction that is almost as stupid. The question we writers are asked most often, the favorite question, is: Why do you write? I write because I have an innate need to write. I write because I can’t do normal work as other people do. I write because I want to read books like the ones I write. I write because I am angry at everyone. I write because I love sitting in a room all day writing. I write because I can partake of real life only by changing it. I write because I want others, the whole world, to know what sort of life we lived, and continue to live, in Istanbul, in Turkey. I write because I love the smell of paper, pen, and ink. I write because I believe in literature, in the art of the novel, more than I believe in anything else. I write because it is a habit, a passion. I write because I am afraid of being forgotten. I write because I like the glory and interest that writing brings. I write to be alone. Perhaps I write because I hope to understand why I am so very, very angry at everyone. I write because I like to be read. I write because once I have begun a novel, an essay, a page I want to finish it. I write because everyone expects me to write. I write because I have a childish belief in the immortality of libraries, and in the way my books sit on the shelf. I write because it is exciting to turn all life’s beauties and riches into words. I write not to tell a story but to compose a story. I write because I wish to escape from the foreboding that there is a place I must go but—as in a dream—can’t quite get to. I write because I have never managed to be happy. I write to be happy.